According meteorological records at the National Weather Service, Denver’s average date for the first snowfall is October 18th and the average date for the last snowfall is April 26th. For those keeping score at home, that’s a full 6+ months of winter driving. As such, it’s in your best interest to be prepared for winter driving conditions. Last winter I wrote a series of posts that addressed many of the issues, questions, problems, and concerns that drivers in Denver and along the Front Range face during this troublesome season. For a round up of those previous articles, check out the list below. What are the best tires for Audi and Porsche vehicles? These eight articles should provide you with an extensive guide as to how you can best prepare for vehicle and yourself for a half-year’s worth of winter weather excursions. Of course, while the above list is extensive, it is by no means comprehensive. 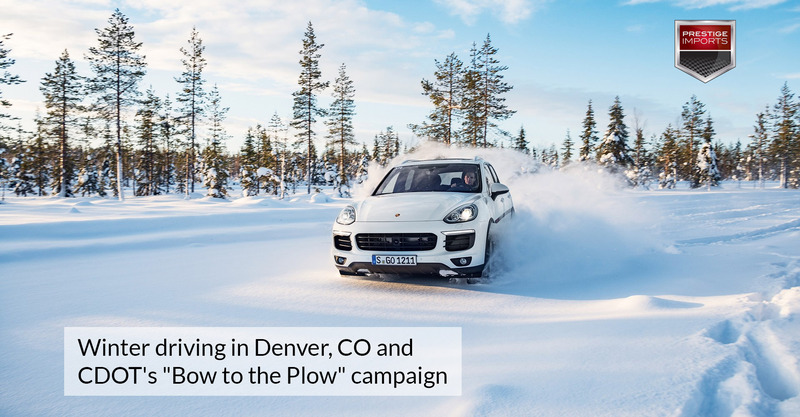 To wit, a couple of years ago the Colorado Department of Transportation (CDOT) launched it’s “Bow to the Plow” campaign that served to instruct drivers how to properly handle their vehicles when near snow plows. Passing during tandem/echelon plowing — Tandem/echelon plowing staggers multiple plows to cover all lanes and clear the entire roadway in one sweep. This is the safest and most efficient snow removal method. It is extremely dangerous for motorists to try and pass plows in this formation because you could encounter white out conditions and ridges of snow between lanes. Tailgating — Plows need to drop deicer and sand, so make sure you stay back three to four car lengths of space. If you’re too close, deicer and sand could hit your car. You also never know when a plow might need to suddenly stop — make sure you have plenty of room to do the same. Passing on the right — Never a good idea! Plows are designed to push all the snow, slush, rocks and other debris to the right of the plow. All that debris could damage your car and temporarily blind you. These tips, no doubt, will help you while on the road, providing you with some Safe Driving Best Practices. If you’d like to read more about winter weather driving issues at the CDOT site, check out the information they provide regarding winter express lanes on I-70, Safety Metering, and other topics. If you’d like more information about preparing your Porsche of Audi vehicle for the winter season, call (833) 825-5423 and speak with a Porsche or Audi Certified Service Advisor. Our staff would love to provide you with information regarding this issue. You can also schedule and appointment in order to have your car serviced before the BIG snow falls upon our fair earth, dusting the ground with a cold white blanket of crystalline precipitation.